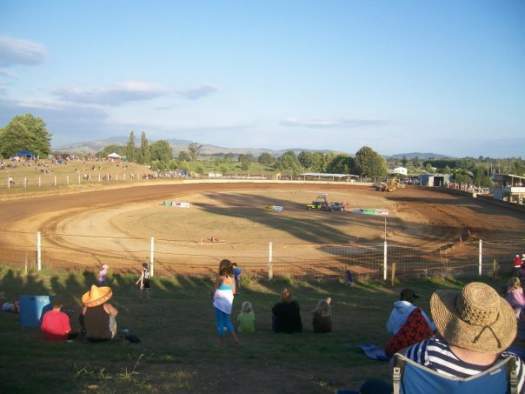 An excellent crowd turned up at Kihikihi Speedway for the Andrew Edwards Memorial. 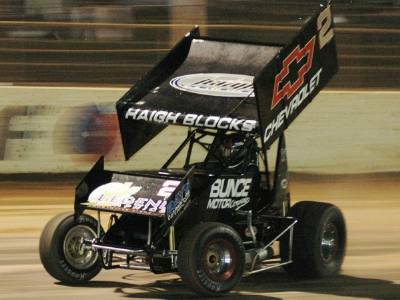 Despite low temperatures track conditions were disappointing for a Sprintcar event. The track lacked moisture beneath the top surface and the dust went flying all night long. Particularly problematic were the exits to each corner. The entrance did offer a high and a low line but problem was the exit didn't which resulted in the two lines converging halfway through the corner. Thus passing was at a premium and heat race action hadn't exactly elevated the pulse rate. Grid for the 25-lap race saw 71k Andrew Edwards (RIP) on pole with 55a Daniel Thomas on two. Earlier in the programme Thomas went from 6th to win the pole shuffle. 22a Dean Brindle and 73k Bryan Edwards occupied row 2. 51m Rodney Wood and 66m Skinny Colson were the third row. It was hard to see any driver from outside the top six becoming a factor at the front of the field. Thomas led away and quickly established a lead over the chasing pack led by Brindle. 88m Keaton Dahm starting from the 10th grid dropped a few spots, seemingly struggling with a tight car entering the corners. The opening stanza of the race was much like the heats, lacking in excitement as drivers went round and round and round. Lapped traffic promised to throw up something different, at least we had some passing as drivers of differing abilities crossed paths. Only problem was there always seemed to be a lapped car between drivers battling for position. 18p Greg Pickerill slipped by Edwards to take the fourth position just prior to the only caution of the race. 5p Clive Cooper stopped exiting turn two. From the restart Thomas once again showed he had the measure of the field, streaking away even more impressively than he did in the opening stanza. Brindle was comfortable in second whilst Rodney Wood was looking good for third until an error exiting turn four allowed Pickerill and Edwards through. Naturally the race would run to an uneventful conclusion with Daniel Thomas taking the spoils from Dean Brindle and Greg Pickerill.